Folksy :: Buy "Adjustable Sterling Silver Ring with Pink Cubic Zirconia"
Looking for something eye-catching and intriguing? 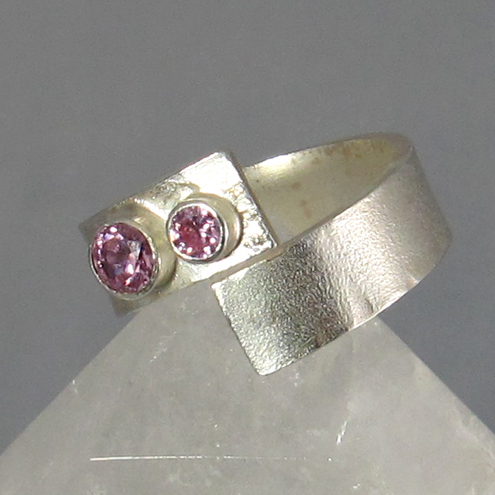 This contemporary sterling silver and Pink CZ ring is fully adjustable. Hand crafted from sterling silver, this unusual ring features 2 bright pink Cubic Zirconia. The gemstones have been set at different heights for added interest. To enhance the colour of the cubic ziconia, the adjustable ring band has been given a frosted, satin finish. Created as a size N, the pictured ring is ready to ship, and due to its adjustable nature can be made smaller or enlarged to suit ring sizes between L and P. Just contact us with your size requirements. Folksy :: Buy "Silver Geometric Necklace with Bright Pink Cubic Zirconia"